Holiday Shopping Guide 2013 | Armchair General Magazine - We Put YOU in Command! It’s that time of year again. Time to don the red suit, groom the reindeer and figure out what to fill the ol’ gift sack with. To help find some special items for the military history buffs and gamers on your list, Armchair General‘s web team compiled our annual shopping guide to books, DVDs, computer and board games. To kick things off, though, here is a partial list of the books and DVDs that were selected by Armchair General magazine’s editor in chief, Jerry Morelock. For the complete list, see Armchair General, January 2014, on newsstands now. 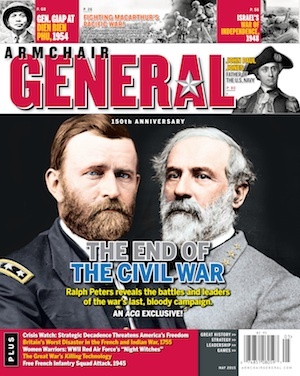 And while we’re on the topic of our publication, remember: a gift subscription or renewal to Armchair General magazine makes a thoughtful and much-appreciated gift that will last all year; now available in digital as well as print format. Saving Lincoln. (Pictures from the Fringe, 2013). Innovative film dramatizing Abraham Lincoln’s friendship with Ward Lamon. Stealing Lincoln’s Body. (A&E Home Video, 2009). History Channel documentary on a bizarre 1876 plot to hold Lincoln’s body for ransom. Charles Lindbergh. Eddie Rickenbacker. Jimmy Doolittle. These three names are synonymous with some of the greatest achievements in American aviation history. Although primarily known for their individual successes, they shared a surprising number of common traits and experiences. Skillful aviators in their own right, their greatest contributions actually came through improvements and advances in aviation doctrine, safety, aircraft design and performance, and military or corporate leadership. Civil War Battlegrounds – The Illustrated History of the War’s Pivotal Battles and Campaigns covers 18 key battles. Clearly written and easy to follow, it is a good starting point for readers just beginning to study the war, but serious Civil War historians are unlikely to find new information here. The Civil War in Color is a fascinating coffee-table sized book that adds life to “dusty images of a dustier past.” Period photographs have been electronically “cleaned up” to improve image quality and then colorized with careful attention to detail. The Guerrilla Factory: The Making of Special Forces Officers, The Green Berets. Tony Schwalm. New York: The Free Press. 291 pages. Hardcover. $26.00. The Guerrilla Factory: The Making of Special Forces Officers, the Green Berets provides insights into the world of Special Forces, presented in a narrative style that makes the book hard to put down. Rick Atkinson’s The Guns at Last Light is a fitting conclusion to his World War II trilogy. This book and its accompanying volumes, the Pulitzer Prize–winning An Army at Dawn and Day of Battle, are a definitive account of the American experience in the Second War in Europe. It will appeal to anyone looking to understand not just the grand advances of the Allied forces, but the human side of war, from the psychology and weighing of competing priorities needed to lead an alliance, to the tremendous physical and spiritual costs incurred not just by the soldiers but by their families and friends. The Hard Slog: Australians in the Bougainville Campaign, 1944-45, by Karl James. Cambridge University Press, 319 pages, $60.00. Karl James, Senior Historian at the Australian War Memorial, Canberra, makes a fresh evaluation of the role and effectiveness of Australian troops as WW2 ground toward its end. Into The Fire: A Firsthand Account of the Most Extraordinary Battle in the Afghan War. Dakota Meyer and Bing West. Random House. 241 pages. Hardcover. $27.00. Into The Fire: A Firsthand Account of the Most Extraordinary Battle in the Afghan War by Congressional Medal of Honor recipient Dakota Meyer is a compelling book that takes readers into the emotions of soldiers during and after combat as few other books have done. A small group of French political prisoners, including four very brave women. A few American tankers with a single tank. Two Austrian resistance fighters. An SS colonel. A Werhmacht unit. Throw them into a Bavarian castle / ski lodge and have them defend against several SS assaults in a medieval-style siege (but with panzerfausts and machine guns). If you tried to make this into a movie, no one would believe it. Lee’s Army during the Overland Campaign: A Numerical Study. Alfred C. Young III, Louisiana State University Press, 2013. Hardcover. 428 pages. Appendix A: Tables; Appendix B: Maps; Appendix C: Order of battle. Notes. Index. $39.95. Alfred Young has provided a superior addition to Civil War literature and plugged a substantial hole in our knowledge of the Overland Campaign. Doing 10 years of research, he found some of the previous strength estimates are not that far off, other numbers were seriously skewed. Casual readers might not find much to savor in the book’s listings of percentages, charts, and tables. Regimental historians, genealogists, battlefield guides, and other researchers, however, will find Lee’s Army during the Overland Campaign: A Numerical Study a valuable addition to their library. Loyal Forces is not sappy, syrupy or lightweight: it is a well-researched, engagingly written book on the role of animals in the American military during the Second World War. The book is divided into seven chapters: Dogs and War; The Army Mule; Pigeons; The Last Cavalry Charge; Loyal Forces on the Home Front; Foreign Encounters; and Pets and Mascots. Well-written and insightful, “Rome’s Last Citizen” is not only interesting for the historical perspective it sheds on Cato and Rome, but also for the light it sheds on the similarities between Rome and modern America. Despite its nautical title, ‘Ships of Oak, Guns of Iron,’ covers both the naval and ground war of the War of 1812 and is a fantastic addition to the scholarship that is shedding new light on this ‘forgotten’ war. Valor in Vietnam, 1963 – 1977 tells the story of America’s involvement in Vietnam through the collected stories of many veterans’ experiences. Several chapters also contain some timeless nuggets of military leadership advice. War Stories: The Pacific, Volume Two: The Solomons to Saipan. The third in the War Stories series from Weider History Publications, edited by Armchair General magazine’s own editor in chief, Col. (RET) Jerry Morelock, Ph. D.
Veterans’ accounts are woven into a narrative (often accompanied by unique maps) that gives them context. Most are taken from interviews conducted by the author, Jay Wertz. Others are drawn from previously published sources and from archives and include veterans from the U.S. and its allies and those of Japan. Narrow Escapes of World War II. Athena Learning, 2012. Thirteen episodes on 4 DVDs. $79.99. The 4-DVD set Narrow Escapes of World War II is the original, uncut UK version of these gripping tales of desperation and courage, and features over an hour of footage not shown when the series ran on The Military Channel in the US. The ‘hook’ in WWII from Space—images shot from space, on which information overlaid—sounds good but isn’t particularly impressive; however, the content and the other visuals make this DVD of a program from HISTORY well worth owning. Want more suggestions? See all of our book and DVD reviews. “Battlefield 4″ offers newly destructible terrain, new modes and new maps. Overall, it is a top-notch game when played online, though its single-player campaign is a bit of a dud. Be aware the computer specs are high—but it may just be worth buying a new computer to play! Battle Academy – Rommel in Normandy is the most exciting and intriguing campaign so far in the BA series. The scenarios are not only tense but evocative. With a greater variety of nations, scenarios, troop types and options, “Birth of Rome” is even more interesting than its predecessor, Alea Jacta Est, which was no slouch of a game itself. AGEOD has managed to keep the core parts of AACW that made it beloved by many gamers, but has taken the lessons learned over the past eight years to heart. Battles are exciting and the use of the Regional Decision Cards adds a deeper level to the game. The ability to build new railroads and upgrade industries give the Confederate States a reasonable chance for victory past the middle of 1862. Command: Modern Air-Naval Operations. Publisher: Matrix Games, Inc. Developer: Warfare Sims, LTD. Boxed Edition plus download: $94.99. Command: Modern Air/Naval Operations is a sprawling and yet detailed tactical and operational level naval warfare simulation that is totally absorbing and compelling to play and worth every penny of its $79.99 price tag. Its high levels of realism give it a steep learning curve, however. With its new element of a “cultural victory” Civilization V: Brave New World gives PC gamers additional ways to win – plus nine new civilizations and expanded trade options. Want more suggestions? Click here to read all of our electronic game reviews and articles. Andean Abyss is an unusual game that simulates quite effectively a chaotic and fluid war in South America, and it does it in less than 10 pages of rules. It minimizes luck, but players have to rely on adapting to the changing politics. The Axis & Allies World War I 1914 game shares some common mechanics with its World War II predecessor, but with a number of twists to reflect the situation nations faced in the Great War. It’s a game, not a history lesson, but players will often find themselves forced into the costly frontal assaults that characterized that war. The second edition of the popular, award-winning Conflict of Heroes: Awakening the Bear! boardgame introduces new units, such as flamethrower tanks, brings the rules up to date with other games in the series, and comes in a redesigned box that is great for storing the components. Field Commander Napoleon from DVG is highly addictive. It offers 11 different campaigns that can be linked to cover Napoleon’s entire career. Programmed actions by Napoleon’s opponents provide for solitaire play; sometimes that results in unrealistic actions, but overall the game is immersive and features beautiful maps and components. Phantom Leader: The Vietnam Air War Solitaire Strategy Game has players choosing aircraft, pilots and weapons for strikes against communist targets. Pilot skills improve with experience. Plays very well and is a blast! That’s the verdict reached in a preview based on a prototype of Sails of Glory, a game of ship combat in the Napoleonic Era that adapts Ares Games’ popular Wings of Glory system to the Age of Sail. The game is expected to hit store shelves in December. Rebel Raiders on the High Seas tackles a greatly underrepresented subject in wargaming. It is a strategic-level game of the naval portion of the American Civil War, covering everything from the whaling areas of the far north to operations along America’s inland waters in support of land forces. Land combat is abstracted. Cards add historical events and personalities, but this is a card-assisted (not card-driven) game. It can be combined with Iron and Oak (see above) to allow ship-to-ship combat at the tactical level. War of the Ring, 2nd Edition, manages the finesse of staying honest to the source material of J.R.R. Tolkien’s fantasy novels without being slavish to the minutiae, and the Lords of Middle Earth expansion adds to the strategic possibilities. Want more boardgame suggestions? Click here to see all of our boardgame reviews and articles.